This chair represents those engineers and trainmen who can’t be with us today. The time book on the chair represents the many hours spent away from their families and friends. The time book is no longer needed because our brother has run out of time. The grip next to the chair represents their home away from home during his or her railroad career. The grip is no longer needed because they have completed their last trip and have gone to their final home. The gloves on the chair represent one of the working tools our trade, they are usually dirty and grease stained, masking the innocence of their hearts and souls. The gloves will be retired because the work of our fallen brothers and sisters is done. 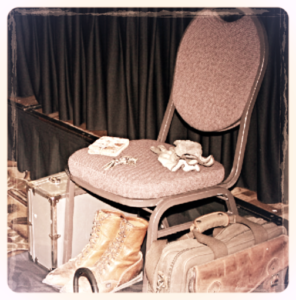 A small tattered brief case which housed the numerous and complicated notices, bulletins, rules, and regulations of our craft is located next the Empty Chair. These are the same rules and regulations that leaders in our industry will manipulate to try to prove that our brother or sister was somehow responsible for their unfortunate fate. These are also the same rules that if followed to the letter, will get you charged by those who feel that warm human employees are no different than the cold hard steel of the locomotives we operate. All too often the “why” cannot be answered. Many times the blame for these injuries and fatalities is blamed on our brothers and sisters themselves. But all too often, this really is not true. All too often the real reason for their tragic accident is inadequate training, defective equipment, and exhaustion. Many times the reason is the lifestyle of the railroader itself. Yet, we all still plug along, do the right thing, and perform our duties to the best of our ability. We all work on a dangerous environment and sadly, accidents are inevitable. In the days of a hostile administration that doesn’t see the value of a professional union work force, and an industry that wants to eliminate needed jobs and crafts to protect profits and corporate interests, An industry that seeks to eliminate FELA, the very legal protection that is our best chance to eliminate the possibility of our brothers and sisters having a tragic final run. And that protects their families if tragedy does occur. We MUST remember those who have fallen in the line of duty. That is our task that is our duty as proud members of the BLET. I ask all of you today to remember those who are no longer with us today. To fight the fights that need to be fought and to leave a legacy our future brothers and sisters will revere. Remembering those who have made the ultimate sacrifice and those who have gone before us . In the line of duty: Chance J. Gober http://www.ble-t.org/pr/news/newsflash.asp?id=5618 CLEVELAND, August 28 – Chance Jason Gober, 40, a member of BLET Division 182 (North Little Rock, Ark. ), was killed in the line of duty on August 17, 2014. He was one of two crew members killed when two Union Pacific trains collided head on near the town of Hoxie, Ark. Brother Gober was born on November 12, 1973, in Sacramento, Calif. He is survived by his wife and three sons. After serving his country in the United States Navy, Brother Gober hired out with the Union Pacific Railroad on March 30, 1998. He earned promotion to locomotive engineer on March 21, 2003, and joined the BLET on September 1, 2006. Brother Gober loved hunting, fishing, camping and spending time with his children. He also enjoyed playing and coaching baseball. He watched and coached his sons in Little League for many years. He is survived by his wife, Heather Glass Gober; sons, Zach Gober and his wife, Ashley, Clay Gober and Jack Gober; mother and step-father, Carole and Jimmy Mullins; brother, Dustin Gober; sister, Jennifer Wells; grandmother, Jean Owen; and grandchild, Bentley Gober. Brother Gober was preceded in death by his daughter, Estee Alexandra Gober; father, Johnny Gober; grandfather, Charles Owen; and great-grandparents, Jack and Josie Owen. Funeral services were held on August 22, 2014, and Brother Gober was interred at Leek Cemetery in Star City, Ark. BLET National President Dennis R. Pierce extended deepest condolences to the Gober family. “The passing of this young man is a great loss to our Brotherhood and the close-knit membership of Division 182 in North Little Rock,” President Pierce said. “Our thoughts and prayers are with Brother Gober’s family following this terrible tragedy. On behalf of the entire Brotherhood of Locomotive Engineers and Trainmen, I extend our most heartfelt condolences to every member of Brother Gober’s family.” Memorials in memory of Brother Gober may be made to White Hall Little League, PO Box 20085, White Hall, Arkansas 71612. Local Chairman Rudy Borrego of BNSF Division 662 of Los Angeles, passed away yesterday 11/9/13 as the result of a head on car crash. He was on his way to take care of and clean up a memorial he created a few years back that was left at or near the site of the Cajon Pass runaway train tragedy (as I understand it). He was hit near that location. The memorial he was taking care of was for a fellow Marine, who was one of the BNSF crewmen killed in the Cajon Pass runaway train accident.Brother Rudy leaves behind his wife and three children. He was a fine man and a fine example of a BLET union officer and Engineer. He would help anyone, and performed his work in an exemplary manner. In the Line of Duty: Dan J. Hall, John S. Hall http://www.ble.org/pr/news/newsflash.asp?id=5296 ORLANDO, Fla., June 29 – Three Union Pacific crew members, including two members of the Brotherhood of Locomotive Engineers and Trainmen, were killed in the line of duty in a head-on rail accident near the town of Goodwell, Okla., at approximately 10 a.m. on June 24. Killed were BLET members Dan J. Hall, President of BLET Division 592 (Dalhart, Texas) and John S. Hall, also of Division 592. Both men were working as locomotive engineers at the time of the accident. The two are not related. Each man joined the BLET on January 1, 1999. Also killed was UTU member Brian L. Stone, a conductor. The BLET Safety Task Force (STF) is on the scene to assist the National Transportation Safety Board (NTSB) with its investigation. STF Primary Investigators Jerry Bullard (Division 212) and Russell Elley (Division 197) are representing the BLET. . Preliminary reports indicate the accident involved a head-on collision between two Union Pacific Railroad trains operating in Centralized Traffic Control (CTC) territory. Goodwell is approximately 100 miles north of Amarillo, Texas. BLET National President Dennis R. Pierce, at the BLET’s annual meeting of the Southeastern Meeting Association in Orlando, Fla., led the members in a moment of silence for the victims and their families on June 26. “This is a horrific tragedy that tears at the heart of everyone in our railroad family,” President Pierce said. “On behalf of the National Division, I extend deepest sympathies to the families. Our thoughts and prayers are with you.” John S. Hall, 49, hired out in 1995. He is survived by his immediate family: wife, Beverly, daughter Breanna, and son Johnathon. A memorial service was held earlier today in Channing, Texas. Dan J. Hall, 56, hired out in 1994. He is survived by his mother, Lyndell McBrayer, and numerous aunts, uncles and cousins. Graveside services will be held at 10:30 a.m. on Saturday, June 30, at the Memorial Park Cemetery with Horizon Funeral Home, Dalhart, Texas. By Dennis R. Pierce BLET National President CLEVELAND, May 25 – Since its inception in 1868, Memorial Day has been a day set aside to specially honor and pay tribute to those who have served in the military for defending our country and our way of life. As we observe Memorial Day 2012, I ask all BLET members to say a special thank you to the men and women who have and continue to serve and defend our great Nation. Please keep those who have made the ultimate sacrifice while in performance of their duties in your thoughts and prayers. Many BLET members will be spending this holiday weekend in active duty, serving America overseas, and we all should be proud of the job they do. We also have thousands of veterans among our membership, who have earned our gratitude for their honorable service. 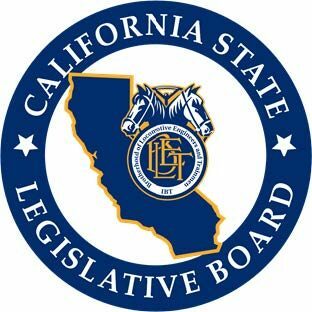 I would also like to take this opportunity to thank the officers of our Local Divisions, General Committees and State Legislative Boards, who work tirelessly to ensure good union jobs and safety conditions for our veterans and all BLET members. These fine Brothers and Sisters are building on the freedoms America’s veterans have secured. On this Memorial Day please join me in thanking those who have worn the uniform for their sacrifice, honor and courage in serving the United States.